For other uses, see Rajendra Prasad (disambiguation). 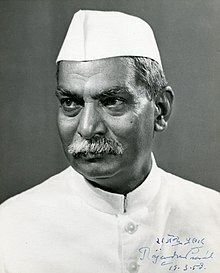 Rajendra Prasad (3 December 1884 – 28 February 1963) was the first President of India, in office from 1950 to 1962. He was an Indian political leader, and lawyer by training, Prasad joined the Indian National Congress during the Indian Independence Movement and became a major leader from the region of Bihar. A supporter of Mahatma Gandhi, Prasad was imprisoned by British authorities during the Salt Satyagraha of 1931 and the Quit India movement of 1942. After the 1946 elections, Prasad served as Minister of Food and Agriculture in the central government. Upon independence in 1947, Prasad was elected as President of the Constituent Assembly of India, which prepared the Constitution of India and served as its provisional parliament. When India became a republic in 1950, Prasad was elected its first president by the Constituent Assembly. Following the general election of 1951, he was elected president by the electoral college of the first Parliament of India and its state legislatures. As president, Prasad established a tradition of non-partisanship and independence for the office-bearer, and retired from Congress party politics. Although a ceremonial head of state, Prasad encouraged the development of education in India and advised the Nehru government on several occasions. In 1957, Prasad was re-elected to the presidency, becoming the only president to serve two full terms. Rajendra Prasad was a Kayastha Hindu and born in Zeradai, in the Siwan district of Bihar. His father, Mahadev Sahai, was a scholar of both the Sanskrit and the Persian language. His mother, Kamleshwari Devi, was a devout woman who would tell stories from the Ramayana and Mahabharata to her son (Rajendra Prasad). He was the youngest child and had one elder brother and three elder sisters. There was religious harmony in the village and the entire community would participate in both Hindu and Muslim religious festivals. His mother died when he was a child and his elder sister took care of him. When Prasad was five years old, his parents placed him under the tutelage of a Moulavi, an accomplished Muslim scholar, to learn the Persian language, Hindi and arithmetic. After the completion of traditional elementary education, he was sent to the Chapra District School. Meanwhile, in June 1896, at an early age of 12, he was married to Rajavanshi Devi. He, along with his elder brother Mahendra Prasad, then went to study at T.K. Ghosh's Academy in Patna for a period of two years. He secured first in the entrance examination to the University of Calcutta and was awarded Rs. 30 per month as a scholarship. Prasad joined the Presidency College, Calcutta in 1902, initially as a science student. He passed the F. A. under the University of Calcutta in March 1904 and then graduated with first division from there in March 1905. Impressed by his intellect, an examiner once commented on his answer sheet that "examinee knows better than examiner". Later he decided to focus on the study of arts and did his M.A. in Economics with first division from the University of Calcutta in December 1907. There he lived with his brother in the Eden Hindu Hostel. A devoted student as well as a public activist, he was an active member of The Dawn Society. It was due to his sense of duty towards his family and education that he refused to join Servants of India Society. Prasad was instrumental in the formation of the Bihari Students Conference in 1906 in the hall of the Patna College. It was the first organization of its kind in India and produced important leaders from Bihar like Anugrah Narayan Sinha and Krishna Singh who played a prominent role in the Champaran Movement and Non-cooperation Movement. Rajendra Prasad served in various educational institutions as a teacher. After completing his M.A in economics, he became a professor of English at the Langat Singh College of Muzaffarpur in (Bihar) and went on to become the principal. However, later on he left the college for his legal studies and entered into the Ripon College, Calcutta (Presently Surendranath Law College). In 1909, while pursuing his law studies in Kolkata he also worked as Professor of Economics at Calcutta City College. In 1915, Prasad appeared in the examination of Masters in Law, passed the examination and won a gold medal. He completed his Doctorate in Law from Allahabad University in 1937. In the year 1916, he joined the High Court of Bihar and Odisha. Later in the year 1917, he was appointed as one of the first members of the Senate and Syndicate of the Patna University. He also used to practice law at Bhagalpur, the famous silk-town of Bihar. Statue of Dr. Rajendra Prasad, Calcutta High Court. 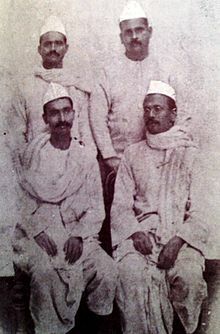 Prasad's first association with Indian National Congress was during 1906 annual session organised in Calcutta, where he participated as a volunteer, while studying in Calcutta. Formally, he joined the Indian National Congress in the year 1911, when the annual session was again held in Calcutta. During the Lucknow Session of Indian National Congress held in 1916, he met Mahatma Gandhi. During one of the fact-finding missions at Champaran, Mahatma Gandhi asked him to come with his volunteers. He was so greatly moved by the dedication, courage, and conviction of Mahatma Gandhi that as soon as the motion of Non-Cooperation was passed by Indian National Congress in 1920, he retired his lucrative career of lawyer as well as his duties in the university to aid the movement. He also responded to the call by Gandhi to boycott Western educational establishments by asking his son, Mrityunjaya Prasad, to drop out of his studies and enrol himself in Bihar Vidyapeeth, an institution he along with his colleagues founded on the traditional Indian model. During the course of the independent movement, he interacted with Rahul Sankrityayan, a writer, and polymath. Rahul Sankrityayan was greatly influenced by Prasad's intellectual powers, finding him to be a guide and guru. In many of his articles he mentioned about his meeting with Sankrityayan and narrated about his meetings with Sankrityayan. He wrote articles for the revolutionary publications Searchlight and the Desh and collected funds for these papers. He toured widely, explaining, lecturing, and exhorting the principles of the independence movement. He took an active role in helping the affected people during the 1914 floods that struck Bihar and Bengal. When an earthquake affected Bihar on 15 January 1934, Prasad was in jail. During that period, he passed on the relief work to his close colleague Anugrah Narayan Sinha. He was released two days later and set up Bihar Central Relief Committee on 17 January 1934, and took the task of raising funds to help the people himself. During 31 May 1935 Quetta earthquake, when he was forbidden to leave the country due to government's order he set up Quetta Central Relief Committee in Sindh and Punjab under his own presidency. He was elected as the President of the Indian National Congress during the Bombay session in October 1934. He again became the president when Netaji Subhash Chandra Bose resigned in 1939. On 8 August 1942, Congress passed the Quit India Resolution in Bombay which led to the arrest of many Indian leaders. He was arrested from Sadaqat Ashram, Patna and sent to Bankipur Central Jail. After remaining incarcerated for nearly three years, he was released on 15 June 1945. After the formation of Interim Government of 12 nominated ministers under the leadership of Jawaharlal Nehru on 2 September 1946, he got the Food and Agriculture department. Later, he was elected the President of Constituent Assembly on 11 December 1946. Again on 17 November 1947 he became Congress President for a third time after J. B. Kripalani submitted resignation. Between 1958 and 1960, President Prasad led 5 state visits to Japan, Ceylon, USSR, Indo-China, Malaya and Indonesia. Two and a half years after independence, on 26 January 1950, the Constitution of independent India was ratified and Prasad was elected the nation's first president. Unfortunately, on the night of 25 January 1950, a day before the Republic Day of India, his sister Bhagwati Devi died. He set about the cremation but only after his return from the parade ground. As President of India, he duly acted as per the Constitution, independent of any political party. He travelled the world extensively as an ambassador of India, building diplomatic rapport with foreign nations. He was re-elected for 2 consecutive terms in 1952 and 1957, and remains only President of India to achieve this feat. The Mughal Gardens at the Rashtrapati Bhavan were open to public for about a month for the first time during his tenure, and since then it has been a big attraction for people in Delhi and other parts of the country. Prasad acted independently of politics, following the expected role of the president as per the constitution. Following the tussle over the enactment of the Hindu Code Bill, he took a more active role in state affairs. In 1962, after serving twelve years as the president, he announced his decision to retire. After relinquishing the office of the President of India on May 1962, he returned to Patna on 14 May 1962 and preferred to stay in the campus of Bihar Vidyapeeth. He was subsequently awarded the Bharat Ratna, the nation's highest civilian award. He died on 28 February 1963. Rajendra Smriti Sangrahalaya in Patna is dedicated to him. Rajendra Prasad painting as Indian National Congress President by Swamy in 1948 issue of Chandamama magazine. ^ The President of India Shri Pranab Mukherjee Archived 11 August 2013 at the Wayback Machine. Presidentofindia.nic.in. Retrieved on 12 December 2013. ^ Janak Raj Jai (1 January 2003). Presidents of India, 1950–2003. Regency Publications. pp. 1–. ISBN 978-81-87498-65-0. ^ Tara Sinha (2013). Dr. Rajendra Prasad: A Brief Biography. Ocean Books. ISBN 978-81843-0173-1. Archived from the original on 10 May 2018. ^ N. Sundarajan (2007). 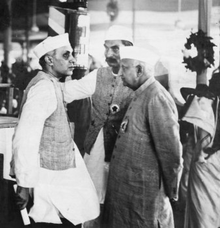 Biographies of the First Three Presidents of India. Sura Books. pp. 2–4. ^ Sanghralaya, Rajendra Smriti. "Major Life Events of Dr. Rajendra Prasad - First President of India". rss.bih.nic.in. Archived from the original on 3 March 2013. ^ Miglani, Neha (20 May 2012). "Evaluators for preserving flawless answer sheets". The Times of India. Archived from the original on 27 September 2016. Retrieved 28 February 2015. ^ राजेंद्र प्रसाद (2007). राजेंद्र बाबू: पत्रों के आईने में. प्रभात प्रकाशन. ISBN 978-81-7315-654-0. ^ "First president Rajendra Prasad remembered - Times of India". Archived from the original on 5 December 2016. ^ "Major Life Events of Dr. Rajendra Prasad – First President of India". Rss.bih.nic.in. Archived from the original on 3 March 2013. Retrieved 10 July 2013. ^ Atul Sethi, "Distant dads?" ''The Times of India'' (Aug 12 2007) Archived 6 July 2008 at the Wayback Machine. Timesofindia.indiatimes.com (12 August 2007). Retrieved on 12 December 2013. ^ "Record visitors at Mughal Garden". www.rediff.com. Archived from the original on 1 January 2011. Retrieved 2 March 2018. ^ About Rajendra Smriti Sanghralaya, Sadakat Ashram, Patna, Bihar, India Archived 26 August 2011 at the Wayback Machine. Rss.bih.nic.in. Retrieved on 12 December 2013. Wikimedia Commons has media related to Rajendra Prasad.